Baseball is back. As a lifelong fan of baseball this is a time of renewal each year and expectation for a good season for my team and for baseball in general. A year ago I wrote about this renewal (read here) and this year I have the urge to write again about baseball. Baseball, unlike other sports, has a very long season – 162 regular season games ranging from April to October. Every team has ups and downs, last inning heroics and gut-wrenching loses. Indeed the best teams will have more of the highs and victories, but even the best team will suffer, have bottom-out moments, and need to respond the next day. 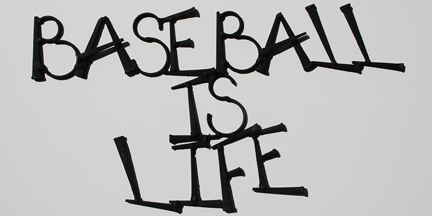 Baseball, with this long and challenging season, serves as a metaphor of life itself. One of these lessons baseball teaches us as leaders, is to remember the big picture. Do not let today’s loss lead to tomorrow’s loss. If today was a bad day (lost the game), let us work harder to win tomorrow. The victor is the leader and the team that makes it through the season knowing that every hard game, every tough loss, is just a part of the whole. There is a great baseball quote attributed to Tommy Lasorda. Yes, back in the “real world” we strive for daily success – a victory each day is important. Yet, this mindset is not reasonable. There will be days where nothing works, a lost day indeed. There are also days where everything flows, a victory with little effort. As leaders it is our job to take that middle third of days and do what we can to turn them into victories. Yes talent and ability are important, but a good leader and team learns from mistakes and get the best out of each person. Contributes come from many sources and the little things indeed add up. Go deep and win the season. Baseball is back, a grand teacher indeed.